Most of the items you will need to sign up for the companies eClubs for, and most also come with a freebie up front, so you can get free stuff now and on your birthday! 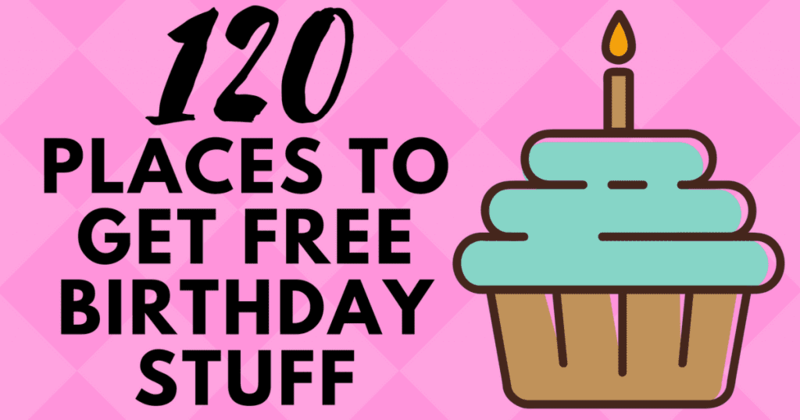 Tips for finding places that offer free birthday stuff: One of the tricks to finding places that offer you free stuff for your birthday is to look for an email list or newsletter sign up. Usually on that page they will have any special offers that you get access to when you sign up. When should I sign up for these Birthday Freebies? Sign up when you can. Most places will need you to be signed up the month before your birthday. In addition, most of the places keep you on their list. So even if your birthday is in 6 months, sign up now so you can be on the list. You should stay on the list year after year after signing up once. What is your favorite birthday deal? My personal favorite is the Benihana. They send you a $30 off coupon which is probably one of the highest value freebies that you can get. Are there any restrictions on the birthday freebies? 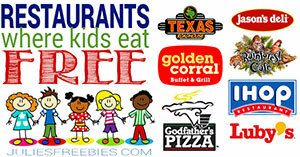 Each restaurant will vary on their rules for the promotions. Call head or look at your offer when you get it (they usually come during your birthday month). Some places only let you use them on certain days or time. If you have questions, call the location you plan to visit for clarification. A&W All American Food – Join the mug club to get a free root beer float on your birthday. Abuelos – Get a free gift on your birthday, your anniversary and one just for signing up! Ace Hardware – Sign up and get a $5 coupon for your birthday. American Eagle – Sign up and get 15% off during your birthday month. Arby’s – Free sandwich for signing up, free milk shake on your birthday. Atlanta Bread – Free cookie on your birthday. Au Bon Pain – Free lunch on your birthday and a Free travel mug for signing up. Auntie Anne’s – Free Pretzel on your birthday. Aveda – Sign up and get a free gift on your birthday. Backyard Burgers – Free burger on your birthday. Bakers Square – Free slice of pie on your birthday, plus a free entree when you sign up. Bare Essentials – Free customized gift on your birthday. Barnes & Nobel – Free cupcake from our café for all your children’s birthdays. Baskin Robbins – Free Ice Cream on your birthday. BD’s Mongolian Grill – Free entree on your birthday. Benihana – You will get a free $30 off certificate to use during your birthday month. Bennigan’s – Free dessert for your birthday, plus a buy 1 get 1 free coupon for an entree. Black Angus Steakhouse – Free dessert for signing up, free steak on your birthday! Bob Evans – Free birthday meal for kids on their birthday. Bob’s Big Boy – Free Dessert on your Birthday. Boston Market – Free surprise on your birthday. Buca di Beppo – Free pasta on your next visit and a FREE $20 birthday gift. Buffalo Wild Wings – Free dessert on your birthday. California Pizza Kitchen – Free dessert during your birthday month and a free small plate for signing up. Charlie Brown’s Grill – Free voucher to use on your birthday. Chick-fil-A – App download, freebies are at the discretion of the franchise owner, so check with your local store for details. Chili’s – Free brownie Sundae on your birthday. Free chips just for signing up. Chuck E Cheese – Free tokens for signing up and free tokens on your childs birthday. Cinnabon – Free minibon for signing up and a free gift for your birthday. Cold Stone Creamery – Free ice cream on your birthday. Corner Bakery – Free surprise on your birthday. Cracker Barrel – Free dessert on your birthday. Culvers – Free value basket for joining, free treat on your birthday. CVS – Get $3 on your CVS ExtraCare card on your birthday. Dairy Queen – Free ice cream treat on your birthday. Dave and Busters – Sign up for $10 in free game play. Del Taco – Free grilled tacos for signing up and a free shake on your birthday. Denny’s – Free Grand Slam breakfast on your birthday. Show ID for this one. Dippin Dots – Free dippin dots on your birthday. Disney Movie Rewards – Get 100 free points on your birthday. Don Pablos – Free $10 voucher for your birthday. DSW Shoes – Free $5 certificate for your birthday. Einstein Bros – Free bagel on your birthday. El Chico – Free fried ice cream on your birthday. Famous Daves – Free meal on your birthday at Famous Daves. Firehouse Subs – Free sub on your birthday, just show your ID. First Watch – Free buy one get one coupon when you sign up. Flat Top Grill – Free dessert on your birthday. Friendlys – Free Sundae on your birthday. Fuddruckers – Sign up and get a free treat on your birthday. Genghis Grill – Free stir fry bowl on your birthday. Gold Star Chili – Free meal on your birthday. Gordon Biersch – Free birthday surprise. Great American Cookies – Sign up and get a free cookie on your birthday. Hard Rock Cafe – Free dessert on your birthday. Hooters – Free wings on your birthday. Houlihans – Get $10 just for signing up and a free dinner on your birthday. IHOP – Get a free meal for signing up, a free meal on your birthday and a free meal on your 1 year anniversary of joining! Jack in the Box – Free dessert on your birthday. Jason’s Deli – Free $5 off coupon for your birthday. Jersey Mikes – Free sub and drink on your birthday. Joe’s Crab Shack – Free treat on your birthday, free appetizer for signing up. Johnny Rockets – Free hamburger for signing up and a free hamburger on your birthday! Krispy Kreme – Free doughnut and coffee on your birthday. La Madeline – Free pastry for your birthday. Longhorn Steakhouse – Free dessert on your birthday. Macaroni Grill – Free dessert on your birthday. Maggiano’s – Free $10 certificate for signing up and a free $10 certificate for your birthday. 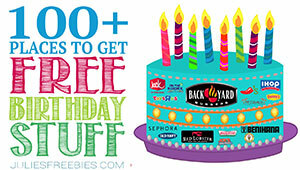 Maggie Moo’s – Free surprise on your birthday. Marble Slab – Free ice cream for signing up. $5 Off reward on your birthday and anniversary. Marie Callendars – Free piece of pie on your birthday. Medieval Times – Free admission on your birthday when you sign up for the King’s Court. Mimi’s Cafe – Free muffins when you join and free entree for your birthday. The Melting Pot – Free chocolate fondue on your birthday. Moe’s Southwest Grill – Free Burrito on your Birthday. Noodles & Company – Free meal on your birthday! Not Your Average Joes – Free gift on your birthday. Old Navy – get a FREE surprise on your birthday. Outback Steakhouse – Free dessert on your birthday. Panda Express – Free offer on your birthday. Panera Bread – Free pastry on your birthday. Perkins – Free slice of pie on your birthday. PF Changs – Free appetizer or dessert on your birthday. On the Border – Free queso for signing up, free gift on your birthday. Olive Garden – Free appetizer or dessert when you sign up. Pinkberry – Free small yogurt on your birthday. Qdoba – Free Chips & Salsa or a drink for registering, free gift on your birthday. RedBox – Free movie rental on your birthday. Red Lobster – Free gift for your birthday. Likely either an appetizer or dessert. Red Robin – Free hamburger on your birthday. Rita’s Ice – Free birthday treat. Sbarro – Free slice of pizza for signing up and free slice of pizza on your birthday. Schlotzsky’s – Free small sandwich on your birthday. Sephora – Free gift during your birthday month. Smashbox – Free gift for your birthday. Sonic Drive In – Free treat on your birthday after you sign up. Sonny’s BBQ – Free meal on your birthday. Souper Salad – Free meal during your birthday week at Souper Salad. Spaghetti Warehouse – Free dessert when you sign up & free meal on your birthday. Sprinkles Cupcakes – Free cupcake on your birthday. Starbucks – Free drink on your birthday. Steak N Shake – Free gift for your birthday. Subway – Free 6 inch sub and drink on your birthday. Taco Cabana – Free Fajita Taco for joining and a FREE Flauta on your birthday. TCBY – Free treat on your birthday. Texas Roadhouse – Free appetizer on your birthday. TGI Fridays – Free dessert or appetizer for signing up, and free dessert on your birthday. Tony Romas – Join the email club for a free gift on your birthday. Victoria’s Secret – Free $10 gift for your birthday. Waffle House – Free waffle on your birthday. Weinerschnitzel – Free hot dog for signing up, free hot dog on your birthday. Which Wich – Free regular sandwich for your birthday. Wing Stop – Free seasoned fries on your birthday.